wild shores of singapore: Changi is alive! 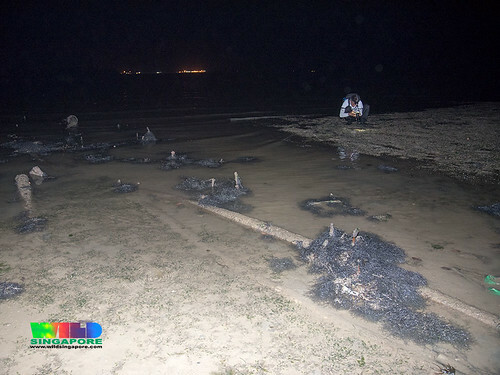 This tiny sliver of seagrass meadows at Changi was impacted by the 300-tonne oil spill in the East Johor Strait in Jan 2017. 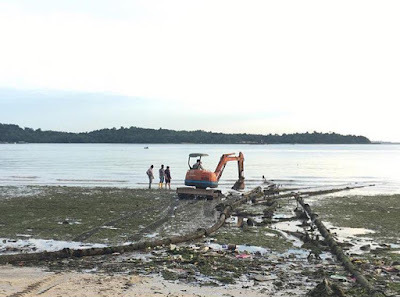 In May 2017, the shore was dug up with an excavator to remove pipes. 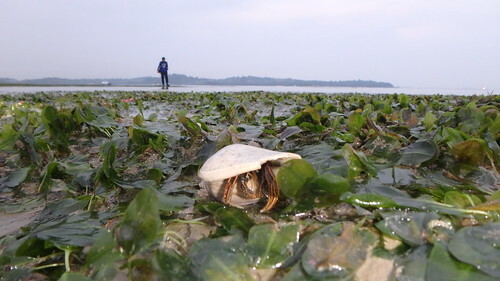 Today, the shore is lush and teeming with life! We saw Common sea stars, the first time we've seen them on Changi, and a seahorse too! This is what was seen in May 2017 on the shore. During our Aug 2017 survey, we saw pipes still on the shore. Today, I didn't notice any pipes. I'm not sure if they have been completely removed or have become buried. There remains an astounding abundance of Pink warty sea cucumbers. 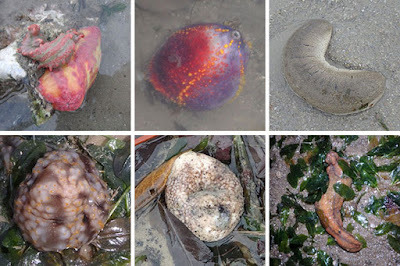 There were also many other kinds of sea cucumbers including: Thorny sea cucumbers, Garlic sea cucumber, Ball sea cucumbers, Orange sea cucumbers, Sea apple sea cucumber. 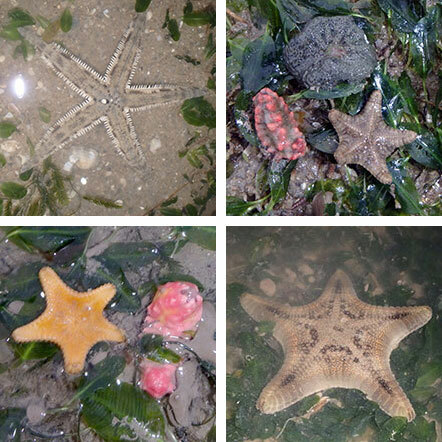 As well as colourful sea stars. 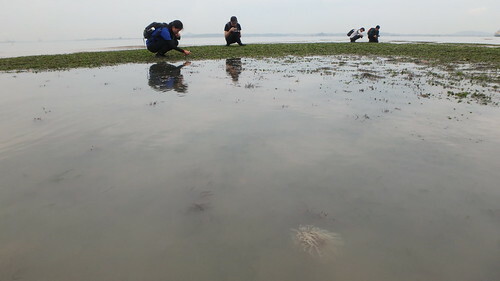 Kok Sheng spotted two Common sea stars, the first time we have seen them on Changi! There were many tiny to small Biscuit sea stars. There were also various kinds of sea pens: Sea Pencils, Spiky sea pens and Slender sea pens. 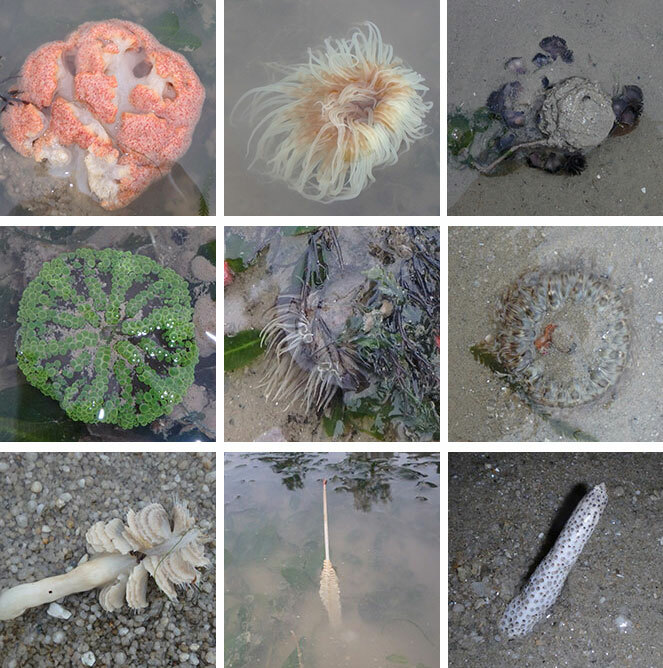 I saw several Tiger anemones, two Mini carpet anemones, many Big hermit hitching anemones. 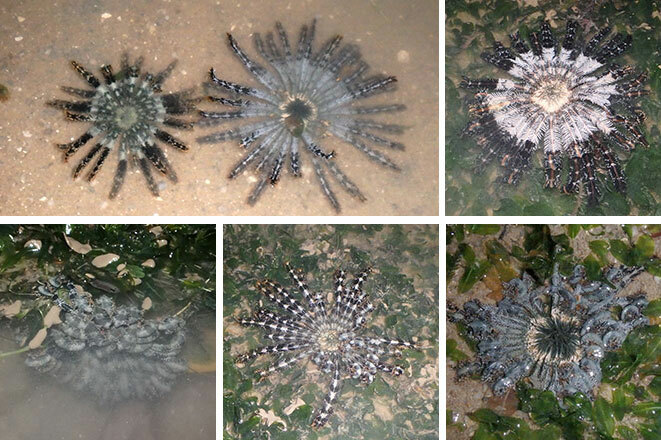 There were a few Common cerianthids with with Black phoronid worms, and a few Ball flowery soft corals. Just as during our last survey in Aug 2017, there were lots of Blue feather stars! I saw one live Spiral Babylon snail. 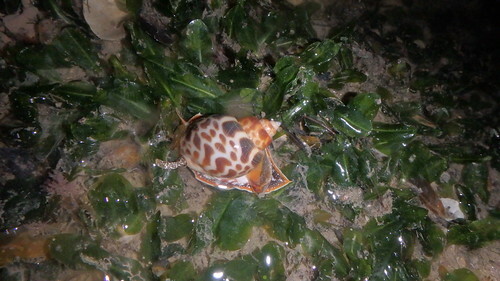 Although there were some shells, taken over by hermit crabs. 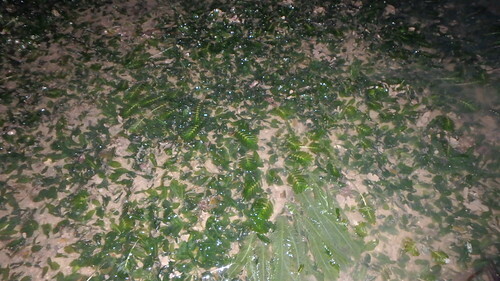 Lush growths of Spoon seagrasses covered the shore, with large green leaves with very little epiphytes. 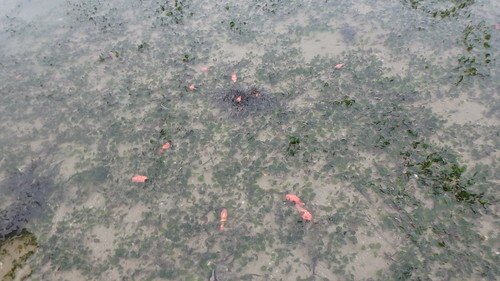 There were also patches of Fern seagrass. 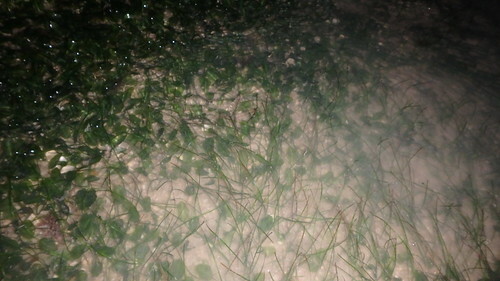 At the Point, there were also patches of Needle seagrass. There are a few natural boulders on the shore facing the Creek. 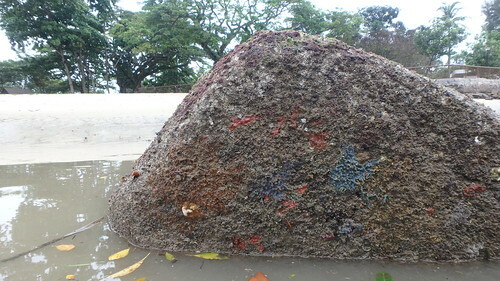 Today, there were colourful sponges growing there. 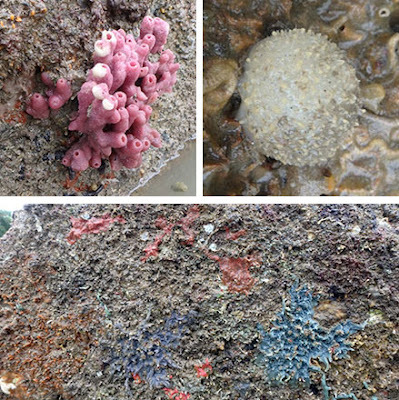 Here's a closer look at some of the sponges. 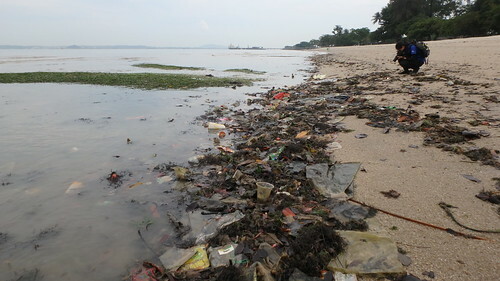 Alas, there remains a load of trash on the low water line. 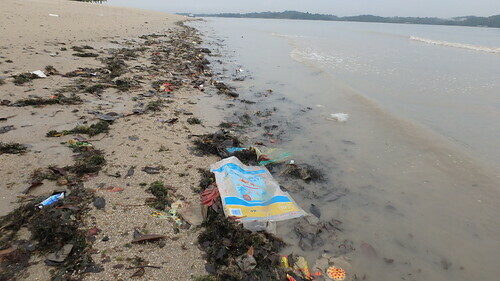 Even though this shore is cleaned every day, trash is removed only from the high water line. As usual, much of the trash is not from recreational beachgoers. They include large bags of rice, sugar, gunny sacks. Probably from fish farms nearby which are not provided with daily door-to-door trash collection. We had noticed a sharp decline in richness during our survey in Aug 2015, compared to the survey in May 2015, when I already noticed a decline compared to our last visit here in May 2014 and Jun 2013. The decline seemed to have stopped in Jun 2016, although the shore was not as rich as it used to be. Today, I sense an uptick. The rest of the team spotted a seahorse, which we used to commonly see in the past. And Common sea stars were seen for the first time. Loh Kok Sheng on facebook. Others on this trip: Jesselyn Chua, Wayne. Some members of the team joined a science survey of Cyrene Reef on 4 Nov.